Back in January, Facebook launched its own version of Twitch’s Partner Program with its own “gaming creator pilot program,” which is designed to lure streamers to away from Twitch and YouTube’s more popular gaming hubs with tipping-style monetization options. Of course, Twitch remains the leader in this space when it comes to live streaming, and YouTube the leader for pre-recorded video. Facebook wants to be a destination for both. But, like YouTube, Facebook is mainly gunning for Twitch’s live audience. That’s primarily because the built-in audience for live, gaming-centric content is massive and skews younger, and younger audiences are more valuable to advertisers. Also, there is inherent value to real-time audience reach and the knowledge that viewers are collectively experiencing the same thing at the same time. It’s Twitch’s live platform that helps it — alongside the predominantly gaming-focused content it features — rival live television and sports. 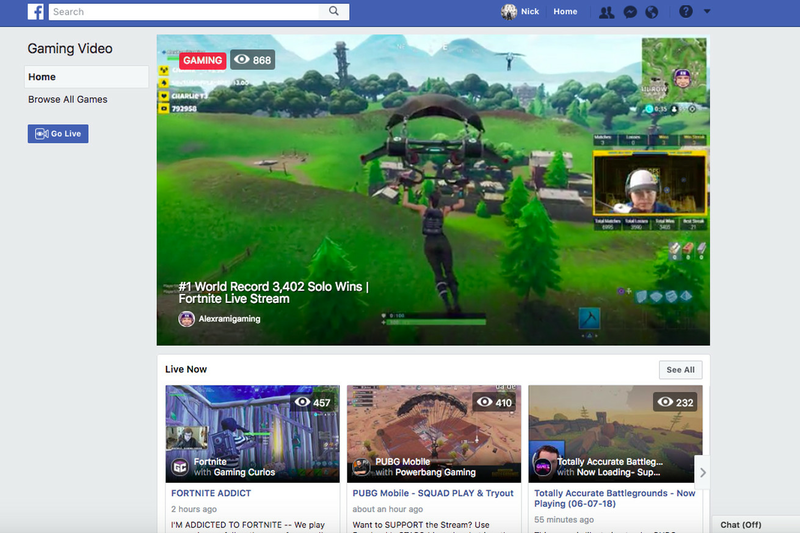 Right now, Fb.gg seems to be comprised mostly of live streams of the massively popular battle royale game Fortnite. That makes sense; Fortnite is one of the most popular games in the world now, and it’s led Twitch’s most-viewed leaderboard for months. On Fb.gg, about 3,000 people are actively streaming Fortnite for an audience of around 210,000, which puts it alarmingly close to the audience numbers for the game on Twitch. We won’t know for quite some time how this will shake out for Facebook, and whether it’s gaming plans will pose any real threat to either Twitch or YouTube. But the social media giant has been trying to crack this slice of streaming for years now, starting with a Blizzard partnership in 2016 to bring Overwatch streaming to Facebook Live. More recently, Facebook added a live streaming component to its mobile Instant Games platform and struck a partnership with e-sports organization ESL One to broadcast Dota 2 and Counter-Strike GO competitions. In March, Facebook launched an API for developers to make it easy to add one-button live streaming through its platform.